One of its most dedicated trackers, in fact, says it is now harder to imagine our solar system without a Planet Nine than with one. “There are now five different lines of observational evidence pointing to the existence of Planet Nine,” said Konstantin Batygin, a planetary astrophysicist at Caltech in Pasadena, California, whose team may be closing in. Batygin and his co-author, Caltech astronomer Mike Brown, described the first three breadcrumbs on Planet Nine’s trail in a January 2016 paper, published in the Astronomical Journal. Six known objects in the distant Kuiper Belt, a region of icy bodies stretching from Neptune outward toward interstellar space, all have elliptical orbits pointing in the same direction. That would be unlikely — and suspicious — enough. But these orbits also are tilted the same way, about 30 degrees “downward” compared to the pancake-like plane within which the planets orbit the sun. They can find planets orbiting distant stars yet they can’t find a large one in our own backyard – strange. If we accept that they are seeing gravitational anomalies maybe, just maybe, those observations are saying that they don’t know everything about gravity like they thought they did and that should be their area of concern but that requires original thought. The problem is that we are in the age of ‘consensus’ science where individual original non group-think ideas are banned so anyone that steps out of line becomes de-funded – not the way to advance science. Mr. Urbain Le Verrier used paper and pencil to predict a position of planet Neptune in 1840. NASA has supercomputers, but that’s the only visible sign of progress in this field. The further out from the Sun you look, the bigger the area you have to search and ’20 times further out than Neptune’ is a vast amount of search area. Also the orbit period of such a body is thousands of years, meaning its orbit speed is extremely slow compared to the background stars. Not impossible but no pushover either. With exoplanets there is no specific target so anything found at random can be zoomed in on so to speak. 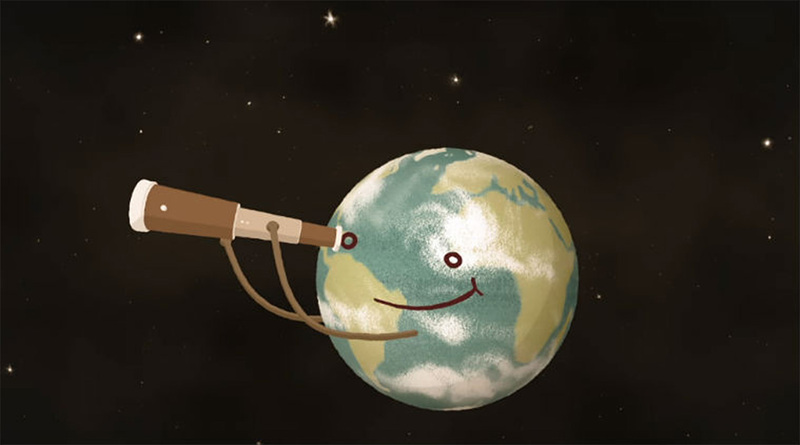 This is how Eris (558 year orbit) was discovered. The three frames were taken over a period of three hours. Any candidate Planet 9 would be much slower-moving, but obviously a great deal bigger (Eris like Pluto is smaller than the Moon). Re Oort: ‘no confirmed direct observations of the Oort cloud have been made’ but it should be ‘somewhere between 50,000 and 200,000 AU’. The Kuiper belt has a cliff edge at 50 AU. ’20 times farther from the sun than Neptune’ is ~600 AU i.e. a very long way from both Kuiper and theoretical Oort. 1 AU is Earth-Sun distance. Planet Nine, if it exists, is very unlikely to be a planet, based upon the current definition of the planet. Planet Nine, if it exists, is hiding in all the debris of the outer reaches of the solar system, so it would appear that it has not cleared these other objects from its orbit; hence the reason for the difficulty in discovering it! Perhaps if Planet Nine is discovered, the definition of planets will be reviewed. Sorry, I had not read the comments before posting my comment. I see that E M Smith has raised the same point. Since nobody knows much about what is beyond about 50-100 AU, and even less so at 600 AU, most options should still be on the table. 703 objects which are possibly dwarf planets. confined to the same perihelion region and orbital plane. Jupiter isn’t where it’s supposed to be and Planet 9 isn’t either (if it’s rocky). They could explain each other. But first it has to be validated. A visual spotting with something like the Hubble would be super cool! My usual complaint is that Planet 9 with it’s suggested mass CANNOT be orbiting the Sun. Basic physics would significantly change the path of the Sun around the SSB if Planet nine existed, so the only possibly would be a rogue planet passing through our neighbourhood or perhaps a stationary object being dragged along…which is probably unlikely. But facts at 600 AU are hard to come by. Personally, I do not consider that we know or understand enough, to add credibility to what is ,in my opinion, simply speculation regarding the existence of Planet 9. If it does exist, it will take us a long time before we know accurate details as to its orbit, so even after its discovery (assuming it exists and is found), it will be a long time before it adds to our understanding of the formation of the solar system. A planet at ~600 AU would in theory at least be in a zone with not many other bodies. 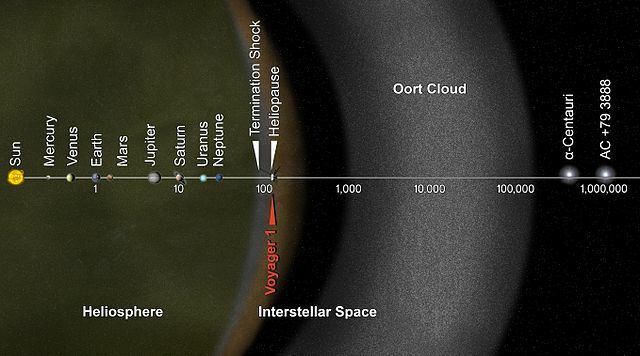 ‘The scale bar is in astronomical units, with each set distance beyond 1 AU representing 10 times the previous distance.’ The Oort cloud is still theoretical. Sedna orbit in white with hypothetical Planet nine. Per Oort cloud: since nobody knows the edges of it, nobody can say P9 hasn’t got overlap and failed to clear it. As there are far more non-planets out far with highly inclined and stretched orbits, to assert P9 is different with no evidence is folly. It ought to be called a distant “object” until some evidence of what it is, exists. Otherwise, I’m just as valid to call it our Dark Star Companion, or Nemesis, or Oort Megalumpkin, or anything else. BTW, comparing Pluto size to the Moon is irrelevant. Pluto self rounds. 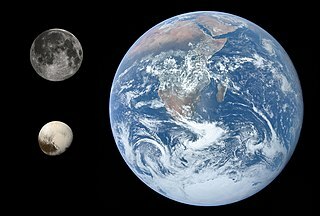 Besides, IMHO, the Moon ought to be classed as a planet and Earth / Moon as a binary planet system. The Moon is never retrograde in orbit around the sun and is always solar concave. The map is 2D, so it can’t be relied on in that way. For example the perihelion of Pluto is ‘inside’ that of Neptune but they are never close and Neptune has cleared its area. Also Planet 9 would only be at its closest to the Sun every ~12,000 years in theory. Agree the Moon is a tricky one. Its rotation period is almost the same as a Carrington rotation. 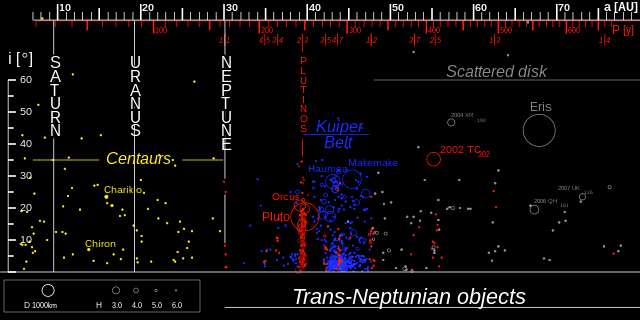 And look at all the yellow blobs by Saturn, Uranus, and Neptune. Then there is the special pleading for Jupiter’s trojans, then… the simple fact is the “cleared the area” standard is stupid and broken. Even Earth has not cleared the area. Things keep whacking into us. The terrestrial planets (Mercury, Venus, Earth and Mars) are shown on the diagram by Cyan or White squares, and their orbits are represented by the blue ellipses around the Sun (the yellow dot at the centre). The Earth is highlighted because of its special importance to us. Small green points mark the location of asteroids which do not approach close to the Earth right now. This does not exclude the possibility that they will do so in the future but generally we can consider the Earth to be safe from these for the near future. Yellow objects (with the exception of the one in the middle which we astronomers call the Sun 😉 are Earth approaching asteroids which are called Amors after the first one discovered. Amors have orbits which come close to the Earth but they don’t cross the Earth’s orbit. However, their orbits are close enough to the Earth that they could potentially be perturbed by the influence of the planets and begin to cross the Earth’s orbit in a short time. 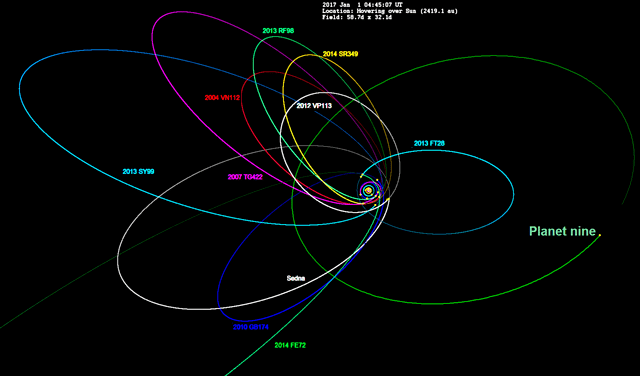 There are over 300 known objects on such orbits. Finally the red boxes mark the location of the Apollo and Aten asteroids. These cross the Earth’s orbit and are the most directly identifiable astronomical threat for the near future. Included in this selection is the infamous asteroid, 1997XF11, which made a major impact on the world’s headlines in March 1997 when observations indicated that it had a good chance of colliding with the Earth in 2028. Thankfully, new observations were made and the newly calculated orbit predicts a close approach of about 600,000 kilometres. Other asteroids which have orbits which may hit the Earth are 1999 AN 10 and 1998 OX 4. Further observation is required to determine their orbits in sufficient detail to predict an impact or a near miss. It is estimated that there are perhaps 100,000 to 1,000,000 undiscovered asteroids on similar Earth crossing orbits. Obviously asteroids, comets and the like are not ‘of comparable size’. A small asteroid buzzed Earth early Thursday (Oct. 12) in a close flyby that scientists had been looking forward to for months. The space rock, known as 2012 TC4, zoomed about 26,000 miles (42,000 kilometers) above Antarctica at 1:42 a.m. EDT (0542 GMT) Thursday. That’s about 11 percent the distance between Earth and the moon, and just beyond the orbit of geostationary satellites. We have been conducting a survey for distant solar system objects beyond the Kuiper Belt edge (~50 AU) with new wide-field cameras on the Subaru 8 meter and CTIO 4 meter telescopes. We are interested in the orbits of objects that are decoupled from the giant planet region in order to understand the structure of the outer solar system, including whether a massive planet exists beyond a few hundred AU as first reported by Trujillo and Sheppard (2014). In addition to discovering extreme trans-Neptunian objects detailed elsewhere, we have found several objects with high perihelia (q>40 AU) that differ from the extreme and inner Oort cloud objects due to their moderate semi-major axes (50<a<100 AU) and eccentricities (e20 degrees). Ninth Planet or Wandering Star ? We study the gravitational effects of two celestial bodies on a typical object of the Kuyper Belt. The first body is a kuyperian object itself with fairly large eccentricity and perihelion but with a large mass, about 16 times the mass of the Earth. The second body is a star whose mass is 30% – 50% of the mass of the sun that passes by our solar system at a speed between 25 km/sec and 100 km/sec and at a distance of closest approach between 0.05 and 0.5 light year. As a measure of the perturbations caused by these bodies on the light kuyperian object, we analyse its eccentricity. We find that the effects due to the passage of the wandering star are permanent in the sense that the eccentricity of the kuyperian object remains anomalous long after the passage of the star. The same is true of the heavy kuyperian object: it can perturb greatly the orbit of the lighter kuyperian object, which leads to a permanent, anomalous eccentricity.